Description: Believe it or not, one of the most famous and delicious nuts, the peanut, is in fact NOT A NUT and is in fact a legume. There are three main types of peanuts, Spanish, Valencia, and Virginia, all of which are slightly different and varying in oil content and resistance to disease. Peanuts begin as an above ground-growing flower until the plant becomes heavier when it will bend towards the ground until it burrows underground. It is underground where the peanut matures. The leading producers of peanuts are India, China, Nigeria, Indonesia and the U.S.A. 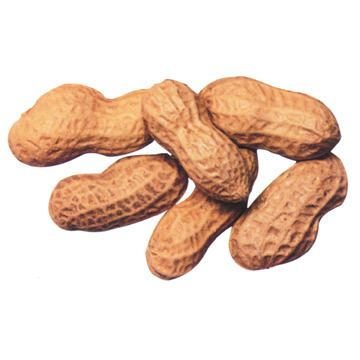 Peanuts have a wide array of uses and can be eaten raw, used in recipes, made into solvents and oils, medicines, textile materials and the very popular peanut butter. Peanut oil is commonly used in cooking and is known to have a mild flavor. Famous inventor, Dr. George Washington Carver, invented over 300 uses for peanuts including shampoo, shaving cream and glue. Roughly 1-2% of the American population has a mild to severe allergic reaction to peanuts. While they are somewhat controversial in terms of their nutritional benefits, when eaten raw they are still believed to be very healthy. Kitchen Pharmacy: Peanuts are believed to be excellent for heart health as they are a quality monounsaturated fat. Peanuts as well as peanut butter have shown to reduce risk of cardiovascular disease in both males and females. In addition, there is belief that peanuts can help reduce the risk for stroke and weight gain. Lastly, peanuts are believed to help protect versus Alzheimer’s as well as help prevent gallstones.